The man behind the restoration of Bluebird plans to run the vessel on a Scottish loch for a second summer, despite the threat of legal action. Donald Campbell's craft was recovered from Coniston Water in 2001 and rebuilt by Tyneside engineer Bill Smith. Last week, lawyers for the Ruskin Museum demanded the hydroplane be handed over so it can go on display. But Mr Smith said the vessel should be seen in action and it would be taken back for test runs on Loch Fad in July. Campbell's family gifted Bluebird's wreckage to the museum in Coniston, but the Ruskin Museum Trust and Mr Smith's Bluebird Project restoration team cannot agree what the craft's future should be. The museum has built an extension to house the restored Bluebird, but Mr Smith said it "was in the public interest" for people to be able to see it in action, as it was "built to run". He said: "It was always built as an operable machine, and now we're locked into that, you can't just switch it off and leave it or things will seize up, things will deteriorate. "It has to be operated on a regular basis or all that hard work will just decay." Ruskin Museum trustee, Tracey Coward, described the news that it would be going back to Scotland as "a surprise". She said: "Certainly the museum hasn't authorised that or been in discussion about it. "We just want to see Bluebird returned to Coniston, both on the water and here in this fantastic museum that really tells its story." 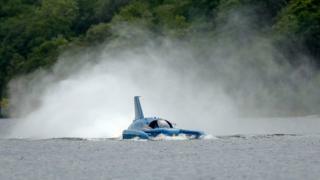 Bluebird: What next for Donald Campbell's record-breaker?